Charlotte was a small country crossroads whose dramatic growth into a major city reflects the emergence of Piedmont North Carolina as a leading area of commercial development in the United States. By the mid-eighteenth century, newly arrived European immigrants, mostly German and Scotch-Irish, had traveled the Great Wagon Road south from Philadelphia into the Carolina backcountry and established small communities along the busy thoroughfare that was bringing thousands of settlers to the interior of the southern colonies. Mecklenburg County was created in 1762 to accommodate these new settlements, and a county seat was to be established on a tract donated by George Augustus Selwyn in an attempt to stimulate immigration to his vast holdings. Enterprising individuals catering to traffic on the Great Wagon Road had already sparsely settled this area, and they named their village after the wife of King George III. Charlotte received its town charter in 1768 and subsequently became the county seat, mainly through the efforts of local citizens who hastily erected a pillared courthouse and other necessary public offices. During the Revolutionary War, Charlotte acquired a reputation as a Patriot stronghold. The town revealed its strategic importance to the British when it was occupied by Lord Charles Cornwallis in 1780. The unfriendly reception accorded the general and his troops, highlighted by the so-called Battle of Charlotte, caused Cornwallis to withdraw and dismiss the place as a "hornet's nest." After the war, North Carolina's hinterland began to flourish. The discovery of gold nearby led to increased settlement in the Charlotte area. Mining activity, including several pits dug almost in the center of town, fueled Charlotte's growth, and proximity to the mines led to the establishment of a branch of the national mint in Charlotte in 1837. Concurrently, several banks were opened in the town, which by the end of the antebellum era was becoming the economic heart of the Carolina backcountry. In the 1850s Charlotte became the southern terminus of the North Carolina Railroad, anchoring one end of the "urban crescent" of commercial and manufacturing activity that would later arc across the middle of the state. During the Civil War, Charlotte's access to the railroad allowed it to host a concentration of important Confederate military installations. Confederate president Jefferson Davis held his last formal cabinet meeting in Charlotte and there received the news of Abraham Lincoln's assassination. Like most other North Carolina cities, Charlotte emerged from the war with its infrastructure largely intact, ready for renewed growth. In the postwar years, Charlotte became one of the leading cities of the New South. North Carolina's booming textile industry, powered by the Piedmont's swift-flowing rivers and streams, intensified economic activity throughout the area, and Charlotte experienced rapid development. Prosperity and a growing population brought cultural advances to the city and led to the establishment of important educational and medical facilities or the growth of existing institutions, such as Queen's College, which had been founded in 1771. By the 1870s Charlotte, along with Greensboro, pioneered the development of public graded schools in North Carolina. The city's racial tolerance encouraged the establishment of several colleges and institutions for African Americans, notably the Biddle Institute, later renamed Johnson C. Smith University. 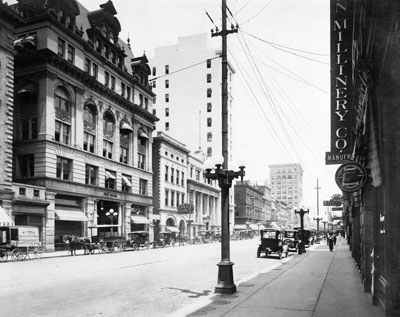 In the twentieth century, Charlotte continued to expand and modernize, mirroring the dramatic rise of central North Carolina as one of the nation's most prosperous economic districts. Numerous industries have relocated to Charlotte to take advantage of the city's position as a major transportation hub. It is also home to some of the nation's largest banking institutions, most notably the financial giant, Bank of America. In the early 2000s, Charlotte continued its heritage of educational and cultural advancement. The University of North Carolina at Charlotte, initially founded as Charlotte College, was one of the fastest-growing campuses in the state's university system. In 1936 the old federal mint facility was transformed into the Mint Museum of Art, and the Levine Museum of the New South was incorporated in 1991. Charlotte has also become a center for professional sports, with deep roots in auto racing (in 2006 the city was chosen as the site of the NASCAR Hall of Fame) and new facilities built to accommodate the city's minor league baseball team, NBA team, and NFL franchise. 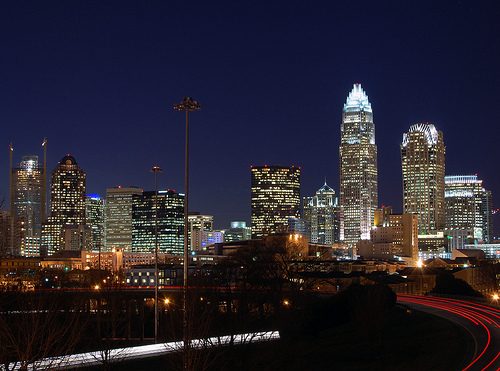 Charlotte is North Carolina's largest city, with a population topping 600,000 in 2005. LeGette Blythe and Charles Raven Brockmann, Hornet's Nest: The Story of Charlotte and Mecklenburg County (1961). Mary Norton Katt, Charlotte: Spirit of the New South (1980). "Charlotte, NC, Trade Street, looking east, c.1923." From Carolina Power and Light (CP&L) Photograph Collection (Ph.C.68), North Carolina State Archives; call #: PhC68_1_16_1. Available from http://www.flickr.com/photos/north-carolina-state-archives/2345371378/ (accessed December 4, 2012). Willamor, James. "Charlotte Skyline." Belmont, Charlotte, NC, US, January 8, 2007. Available from: Flickr Commons, http://www.flickr.com/photos/bz3rk/3180363127/ (accessed December 4, 2012). I didn't know Charlotte had so much history!